- What variants of the EP10 are available ? - What are the main specifications ? Windows Embedded CE is not supported from EP10. Scanner The EP10 is available with and without 2D imager option. Units with imager have engine Intermec EA11 built in, specification link. It is not possible to change scan engine by user. A Pistolgrip is not available. It is possible to navigate and use the EP10 with finger input (smartphone style). Besides a standard stylus can be used (RV6101), which fits in the stylus slot of the EP10 unit or can be attached outside the unit with the included tether. The keyboard is available in alphanumeric and numeric variant. 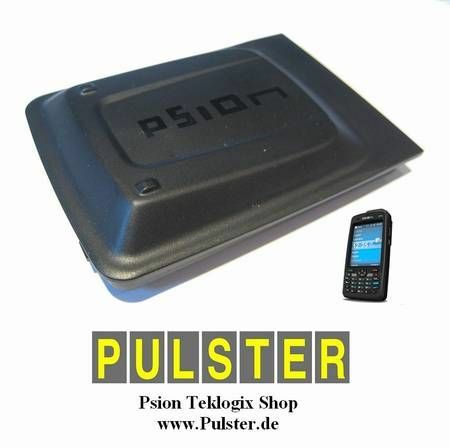 -Where can I find more informations about the Psion EP10 ? The most helpful site is the Psion Community site with full specification sheet: Link , user product guide Link user manual: link and helpful video documentations: link. - what do I need to start with ? The EP10 comes with battery (RV3005 or RV3010), handstrap and tethered stylus. For start working with the unit you need at least a charging option, see below please. RV6005 To connect a power adapter directly to the EP10 use charger cable adapter RV6005. These adapter clips provide a charging port for the unit.You can connect a power adapter directly to these snap-on adapters. Docking station RV4000, RV4004 The desk docking stations can charge the battery inside the unit as well charge a spares battery in a second slot. Single unit docker is RV4000, quad-unit docker is RV4004. RV3004 You can charge up to four batteries externally with it. A wall mount (RV3007) for this charger is available. Vehicle charging options RV1005 The powered Vehicle Cradle RV1005 provides a charging port. You can connect a power adapter directly to this cradle. Inside vehicle it is common to use the vehicle power adapter RV3050 with cigarette-lighter-adapter (CLA) plug. A second option is to use the non-power vehicle cradle RV1000 together with adapter cable RV6005 (see 1. on top) to connect a power adapter to the unit. 2. High capacity battery RV3010 with 3600mAh. Charging time is 3.5h, working time 8-12 hours (depending on usage) and 50 hours suspend time. Life time of battery is 3 years/300 charging cycles. Besides the EP10 has a backup battery. It will remain data while replacing main battery. It is soldered to mainboard and not user-changeable. You can extend battery life configuring power management accordingly (/Start/Settings/ControlPanel/Display & Power): suspend power settings, reduce backlight, keypad brightness. 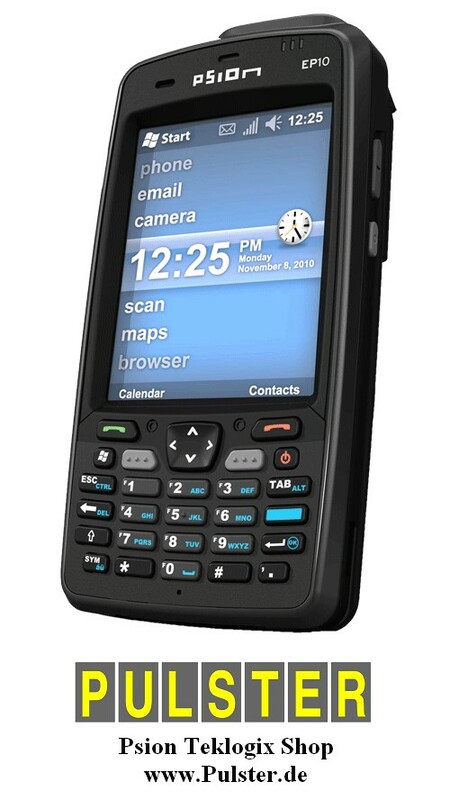 If not needed, disable Bluetooth, GSM/GPRS, SD-Card Slot. Teklogix recommends to use default power managment settings to get the best battery life. - wired communication options ? 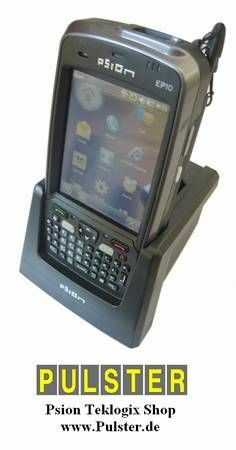 Option 1: docking station RV4000: the docked EP10 connects via USB to any desktop PC. Option 2: snap module RV4001 - this adapter clip provides a micro-USB port to communicate via adapter (PX3053) with a PC. Option 1: snap module RV4001 - this adapter clip provides USB On-The-Go port to connect external devices. Option 1: quad docking Station RV4004 provides 10/100 Base-T Ethernet port. Option 2: adapter PX3052 - it will be attached to the USB-port of the single dockingstation and will provide an Ethernet port. Option 1: snap module RV4002 - this adapter clip provides a serial DB9 port. 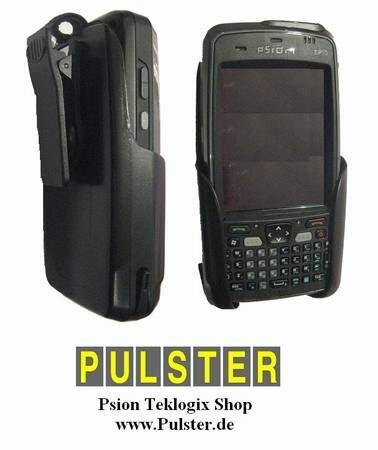 It can be used for data communication as well as for charging the unit with power adapter (PS1050/RV3050). - wireless communication options ? 1. Cradles: if you need a simple vehicle cradle, choose the non-powered cradle RV1000. This cradle provides access to all keys and buttons while the EP10i is docked in the vehicle. However if you want to charge your unit with the onboard power, choose powered cradle RV1005. You can attach cradle RV1005 with the CLA-power-adapter RV3050 directly to your onboard vehicle power. Besides USB-communciation is possible. 2. If you don't need a holder / cradle inside your vehicle, but just a charging solution, use CLA power adapter RV3050 with adapter clip RV4001 or RV4002. It is possible to attach CLA power adapter to the onboard power with adapter RV1205. 3. Mounts: To attach the cradle to the vehicle we suggest a RAM mount WA3006 (screw attachment) or RAM-B-166-202U "Suction Cup Mount". Screen: to avoid scratches on the touchscreen from heavy-duty stylus input, you can attach a screen protection RV6105. Handstrap: The handstrap RV6021 will be attached on the backside of the unit and provides secure hold with one hand. Unit is useable also left in the pouch ! - My unit does not power on ? 1. Try a soft/warm reset first (see below). 2. Check if battery is charged well: red LED indicates faulty battery/charger, blinking yellow LED indicates low battery charge. Units with too low battery does not power up. Place unit in the desktop docking cradle. Check if battery is inserted properly, otherwise it won't charge on the docker. 3. Finally try a hard/cold reset (see below). 4. If all solutions fail and unit remaind "dead", please contact vendor/manufacturer for service. - How to reset the unit ? 1. Soft/Warm reset: factory settings are retained, but any unsaved personal data is lost. Press and hold POWER + BLUE simultaneosly 4 seconds. 2. Hard/Cold reset: returns the unit to factory settings, all datas are lost ! - Press and hold POWER + BLUE + SYM simultaneosly 4 seconds. 3. Clean start: to reset the unit 100% to factory settings, press POWER + BLUE + left Scannerbutton simultaneosly 4 seconds. The EP10 shows then a system-menu ("BooSt"). Choose option "clean start", typing ".clean" on alphanumeric units and ".25326" on numeric units (please mind the starting point before). None of these reset-options erases OS system, so you will never be left with a non-working unit. But please note a CleanStart disables the Imager and makes new installation of drivers necessary. - How to connect the EP10 with the PC ? Software: Windows 7 + Vista users require Windows Mobile Device Center, Windows 2000 + XP users require ActiveSync. Download links. Running Active Sync with Windows XP, please check you have admin rights, firewall settings, active DHCP-client, active Netbios over TCP/IP. Most connection problems with Windows 2000/XP are gone if you install USB drivers: USB Setup application (PTX P/N: 1000997). Option 1: docking station RV4000: the docked Omnii connects via USB to any desktop PC. - Imager does not work properly ? Please download and install 1. the ADD ON Software Pack and 2. the .cab drivers for the imager. (due to copyright issues these drivers cant be linked here). If imager light show up, the hardware is installed properly. Try simple EAN code first, mind the scan ankle and maximum scan distances of c. 40cm. - Unit is locked ? To enable keyboard input, press SYM, BLUE, Back(space) one after another. ("Backspace" is the arrow left symbol). Default setting of screen lock is ON. To disable it, please go to: Start -> Settings -> Personal -> Buttons -> Auto Lock, then remove cross from the checkbox [ ] Lock when screen is covered. If you cant find this setting, you need to install the Psion add-on-pack first. - What spare parts are available ?